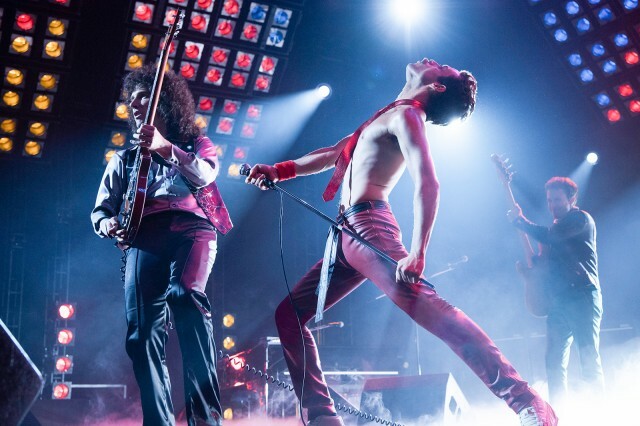 I booked the tickets last week to see Bohemian Rhapsody at the local cinema, the day after its release, here in New Zealand. Which is today. I wore one of my Adam T shirts, as I did to the concerts I have seen of Queen and Adam Lambert. I don’t consider myself a Queen fan. I like the songs, but never really knew much of the band itself. I just adore Adam singing the songs of Queen. I really liked the movie! It was entertaining, sad, and funny. I don’t know a lot about the concepts of their songs, or the timeline in which it all happened for them, so I really enjoyed the insight that the film gives us. It was as if Adam was a ghost in the theatre! A good handful of times I got goosebumps and I was transported, so cleverly, back to my spot in the audience of the concerts I have seen! I kept hearing the songs sung by Adam. I have honestly watched SO MANY HOURS AND HOURS of concert performances of Adam singing with Queen that I know the songs back to front. Songs I never knew existed before Adam joined Roger and Brian. I kept seeing Adam in his tight black leather of the first world tour in 2014, strutting the stage in front of me! The absolute joy of being taken back in time was everything! When Freddie walks down the stairs in his crown and cloak, my heart skipped a beat. I could see, in my memory, Adam standing in front of me in his glorious crown and gold cloak! Woooo hoooooo! Hearing the songs, and seeing them being performed in the movie has made me yearn to see Roger, Brian and Adam one more time! Please please please come back over this way for us again! I feel like I appreciate Freddie more than I could have believed I would, after seeing the movie. The concepts and stand out talents of all of the Queen members were very much in the forefront of the film. I also have come away thanking Adam for bringing these songs and the mastery of them, into my life. Of course, I have always known the hits of Queen, but since Adam, I understand them more and enjoy them more. I have listened to Adam singing them so much, hours and hours of footage from all of their concerts. I have watched hours and hours of live streams, from all sorts of time zones, making me being able to catch the stream a challenge at times! I loved Adam’s cameo in the film! A brilliant small glimpse, of an extra almost. 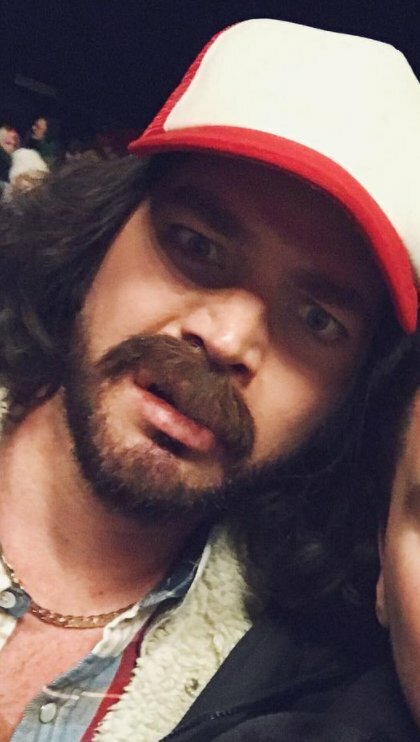 Even though he is underneath a wig, trucker cap, false teeth, and a moustache, heavens above, when that camera pauses on his shoulders and back! Wooooooo hoooooooo! NOW THAT’S HIM! Hahahhahahaa! I am so pleased I saw it, and I am so pleased, at this time in my life, to have been exposed to the deeper Queen catalogue through Adam singing the songs. I feel so pleased that I have been a part of the tours and a part of the audience and seen and heard Roger and Brian play. Both are masters at their craft. Brilliant musicians and men of grace and humility. I have really loved watching hours of interviews with them, as they tour with Adam, and I have tremendous respect for them. I loved seeing a part of their back story, in the film. I enjoyed seeing a representation of Freddie and he came across as endearing and strong. So, in short, I thank Adam for bringing these fabulous songs to my attention, and for Roger and Brian for still bringing these songs to us, by touring and being so damn awesome on stage. Oh, and there are so many fabulous songs, ‘I Was Born To Love You’, ‘Save Me’, ‘Spread Your Wings’, ‘Hammer To Fall’ just to name a few. Wonderful peice ,you could be me. I couldn’t put into words how I felt Adam was with me all through the movie . But the Feeling like the Ghost of Adam was with me covers it perfectly. It must have been so odd for him sitting in the theatre and not want to burst into song . Fabulous movie all round . I have been a Queen fan for YEARS so when they got together with Adam, yes, Ive been hooked since his audition, it blew my mind. 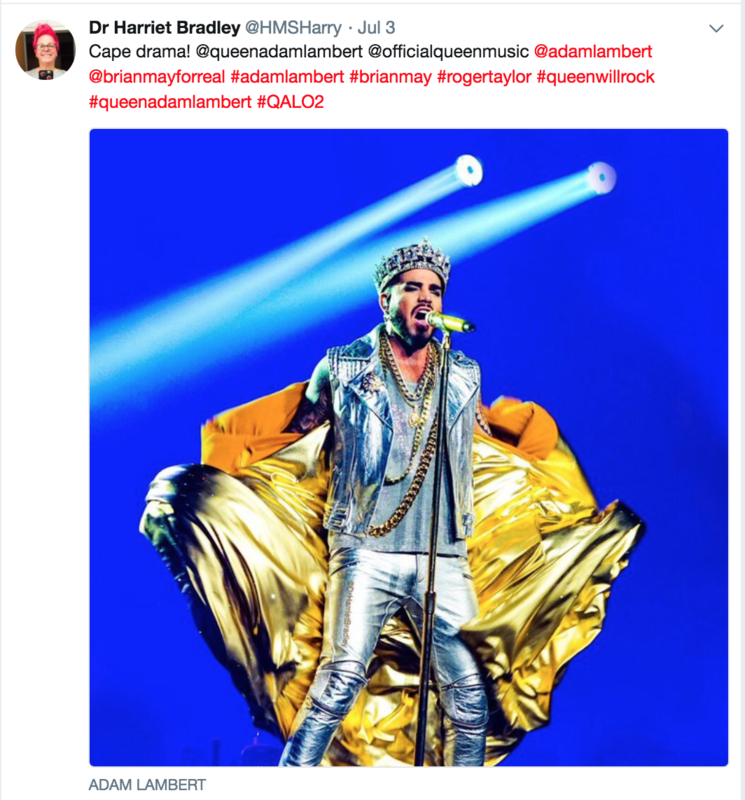 I’ve seen Adam solo many times and QAL probably 9 times, the most recent the last 3 shows of their residency in Las Vegas. I love his music but he was also born to sing that fabulous Queen catalogue. Hi Carolb57! I just love Adam singing ‘I Was Born To Love You’, so much. I see that song was in the films credits, but funnily enough, I can’t recall hearing it in the movie itself! It must be in there if it was in the credits eh? @AdamLambert presenting the Hollywood Documentary Award to @DanReynolds for ‘#BelieverDoc’ at the #HollywoodFilmAwards last night. VIDEO|@AdamLambert presenting the Hollywood Documentary Award to @DanReynolds for '#BelieverDoc' at the #HollywoodFilmAwards last night. The advice ‘desperate need for acceptance of others’ …to me, is not just about LGBTQ which is passionately, rightly Adam’s main concern. To me, the key advice is acceptance for *all others; double standards for one set of people over another is repugnant to me and I have shouted from the top of the roof about that! Waaah! Who Wants To Live Forever (partial). Come to think of it, this song ‘gifted’ to Adam by Dr Brian May, can be viewed in separate parts, actually can feel the lyric/vocals even more. Phantombert was on the fifth floor balcony of his historic mansion, admiring the reddish moon and exercising his vocals. A blue light flashing intermittently caught his eye. His first thought was Dracul was returning from his unknown nightly exploits. Shifty shadows lurked; long drawn-out howls echoed; owls with bright yellow eyes hooted…nature’s concerto in tandem with Phantom’s fearless vocals as he practised for the upcoming QAL concert…his voice reverberating across the murky moor. Dracul seemed to be heading towards Phantom’s mansion. Well well, Halloween had arrived. He checked his latest-acquired Caesar ring, smiled, contemplated on how Dracul would react to this new vaporiser-ring, more lethal than his Skull-infrared. The reddish full moon shone on his gleaming black hair with a dangling side kink and mysterious countenance; accentuating his dark-rimmed eyes and aristocratic nose. Out of the blue, a sudden gust of wind slammed into his face, whoa! almost toppling him from the fifth floor balcony to the ground. This must be the invisible Dracul shapeshifter. Phantombert, as his name suggested, knew exactly how to deal with these ‘Evil In The Night’ forces. Instantly directed his vaporiser-ring to neutralise the force which was encircling him. The vapour spread out in a shroud of greenish gas asphyxiating Dracul who emitted an eerie bawl that rang out into the chilly, moonlit moor; echoed by a slew of werewolves from the distant vampire hills. Phantom backed to a corner and slowly inched his way back into his mansion. He walked down the winding staircase into the basement where his vintage wines were neatly stacked on rows of oak shelves. He wanted a glass of antiquated wine to calm his nerves. He selected a favourite vintage-dated label. As he was leaving, some scratching sounds distracted him and he sensed a strange presence; so he walked back to check what it was. Lo and behold, a sensuous python was dangling from one of the wine shelves… Lily White Snake ! his unrequited reptilian lover. He stroked the python lovingly. Suddenly, Lily’s eyes glowed…Phantom backed away… he suspected she could be under the hypnotic influence of Dracul lurking in the cellar. Lily White Snake wouldn’t do anything to hurt Phantom as she loved him. Gasping for breath, goodness gracious, Lily…slow it down…what do you want from me! Phantom became immobilised, close to losing consciousness. At this juncture, a strange bright light illuminated the whole mansion and the floor shook. Phantombert struggled to get up…..Lily had loosened her grip and slipped off due to the commotion and shaking in the basement cellar. Seizing this opportune window of escape, he grabbed the staircase banister, staggered up the creaky staircase towards the mansion door. With great difficulty, pulled the fortified door open. From the frying-pan into the fire ! A thunderbolt of silvery light engulfed him; he felt a strange but familiar brain telekinesis…from someone he knew. He got out and what accosted him was beyond imagination. A star-shaped space-drone had landed on the roof of his ancient mansion ! That probably explained the vibrations in the cellar. Psychedelic lights ejected from every direction of the state-of-the-art spacecraft. The hatchet opened and out stepped a formidable figure; a metre-tall Red Spider standing on all 8 jointed legs! Ooooh-la-la… Phantombert, by now disoriented, heaved a sigh of relief to see a familiar Alien! A friend finally…Spider King, his once life-saver, crouching like a dragon on his rooftop! Can’t get any more bizarre. Phantom whistled to his arachnid pal… Wheeioou..wheeeet! It rang out above the din of the space-drone. Soon, an entourage of Red Spiders filed out from the spacecraft, ambling clumsily not being accustomed to Earth’s gravity; but tactically released a silk mesh from their spinnerets, attaching it to the eaves of the roof, to land on the ground. Phantom pinched himself, thought he might be hallucinating. Yes, now he recalled how these Red Spiders had once rescued him when his space-chariot crashed on their Mars planet some years back. They extricated him from the wreckage and carried him back to their Red cave and that was where in his delirium, he sang Outlaws of Love to calm himself. Wow! these Spiders from Mars remember my song, not so tiny brains after all ! He was touched by their arachnid love…no wonder they weave such intricate webs. As Phantom approached them, via the winding staircase, their exoskeletons vibrated vigorously, obviously very excited to see their Earthling friend unscathed from the Dracul attack. They had actually witnessed what befell him in the basement wine-cellar, a short while ago. In fact, they rescued him by shooting invisible projectiles to dislodge Lily White Snake from his neck. Soon Halloween celebrations started as that was what the Red Spiders had originally come for. The party went on till the wee hours of the morning. Even the werewolves and owls joined in…howling and hooting in tempo and rhythm. Owooooooh…hooooot hoooot…A woodpecker was knocking incessantly providing the bass: Tock..tock..tock..tock on the willow branch. Aha, so happened to Dracul? He was spotted spying from atop a droopy willow. Even he had never seen anything so grotesque! One-metre tall Red Spiders that sang and enjoyed partying! Lily White Snake slithered back to the murky moor feeling rather guilty to have attacked someone she loved. In the midst of all the festive celebrations, a handsome beau in an impeccable suit and red face-mask, a matching red demon tail, joined the party. He walked towards Phantombert…embraced and kissed him. Hi! Samore! Had been waiting for you all night! Samore never missed their annual Halloween rendezvous. They hugged…their hearts close to each other and danced in a dreamy gaze, their blue eyes met, beneath the starry sky. Good luck Phantombert and Samore! From his accent, he sounded familiar, a special bosom lover from yonder. Finally, the Red Arachnids bade Phantom good night and ambled back to their space-drone on the rooftop climbing the silk web they had spun dangling from the eaves. Reeaaad Spiiiiders! … Flyyy..yy ! Thus ended a most unexpected, monumental Halloween 2018. Phantombert walked hand in hand with his mysterious companion, Samore, back into his vampire mansion. @AdamLambert on Instagram Stories – at dinner with his dad and stepmother. Aha, I know someone liked my Phantombert, Mars Spiders story…how do I know that; well she would pick a word from my story and use it on Newsroom. So what word did she pick?